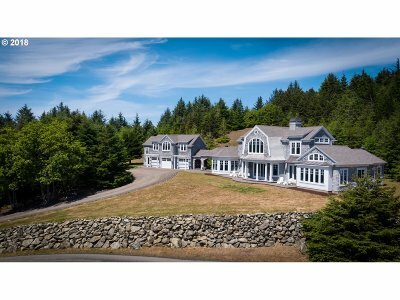 Undoubtedly one of the finest homes on the Oregon Coast, this custom Nantucket home has superior ocean views from virtually every window. With gambrel roof lines, copper awnings, cobblestone walks & shingle siding this is the quintessential beach home. Inside the treasures await-Carrera Marble countertops, Ash Wood flooring, Beadboard Wainscotting & Volcanic Ash Bathtubs to name just a few of the special finishes. Adjoining Lot available.